Jon Favreau and Artie Lange share behind-the-scenes secrets about the film. Aside from the jokes, the singing, the nostalgia and the quotable scenes, Favreau and producer Peter Billingsley spoke with "20/20" about some of the behind-the-scenes antics and stories from the set. We remember Favreau on screen as the doctor that administers Buddy’s DNA test and tells him to stop eating cotton balls, but he also talked about his voiceover work in the movie. 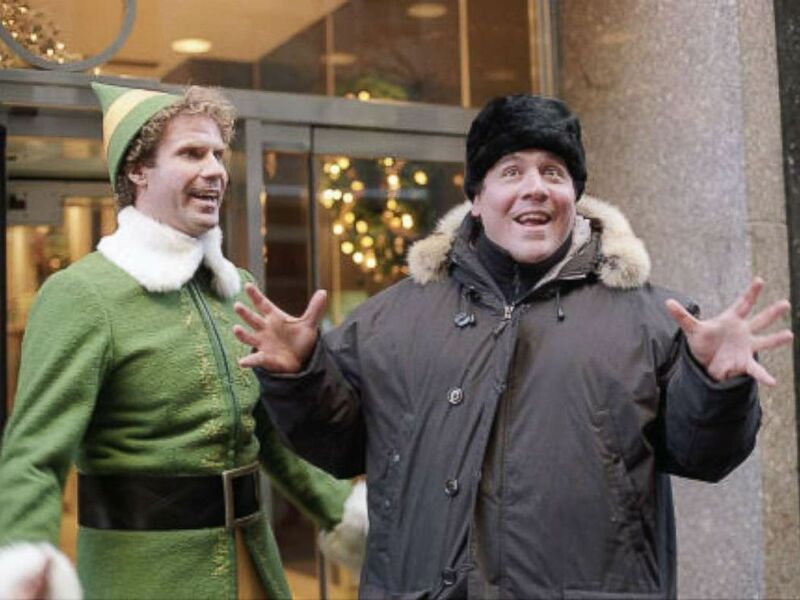 (IMDB) Will Ferrell and Jon Favreau in "Elf," 2003. Producer Billingsley, who is best known as Ralphie in “A Christmas Story,” made a cameo as a toy-making elf in Santa’s workshop on the film. “Part of why I asked you to cameo in the film was because I wanted some of 'The Christmas Story,' that good mojo,” Favreau said to Billingsley, who has gone on to have a successful career as a producer and worked with Favreau on the "Iron Man" movie. (IMDB) Will Ferrell, Kristian Ayre, Peter Billingsley, and David Avalon in "Elf," 2003. 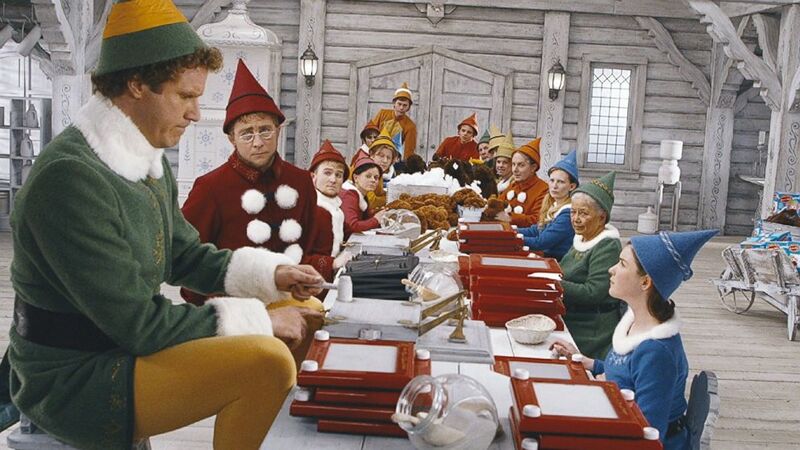 The interaction between Will Ferrell as Buddy the Elf and Artie Lange, as the department store Santa who “smells like beef and cheese,” was mostly improvised over several takes, Favreau said. But he said the actual fight between the characters had to be done in one take. Favreau and Lange both told "20/20" that the movie's art department worked long hours over two weeks to set the scene with an elaborate LEGO city-scape, Lite Brite displays, and miniature train setup. The actors literally only had one shot to bust it apart. 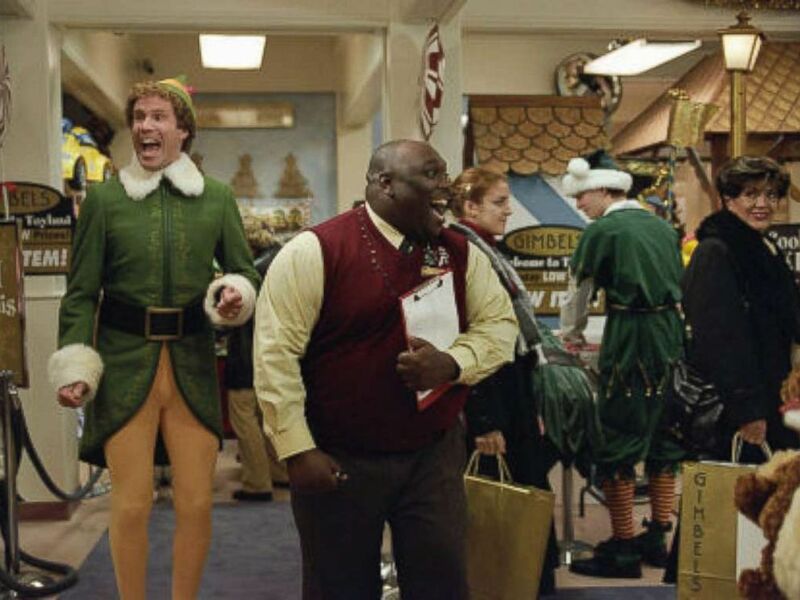 (IMDB) Will Ferrell and Faizon Love in "Elf," 2003. “They have to smash the whole [thing] -- so we don’t really have a lot of resets,” Favreau said, laughing. “They gutted an old insane asylum and made it a sound studio,” Lange said of the Vancouver shooting location. The department store Santa actor said one day he was sitting in wardrobe when Ferrell walked by in his Buddy costume and, knowing the building's history, Lange had a good laugh about it. 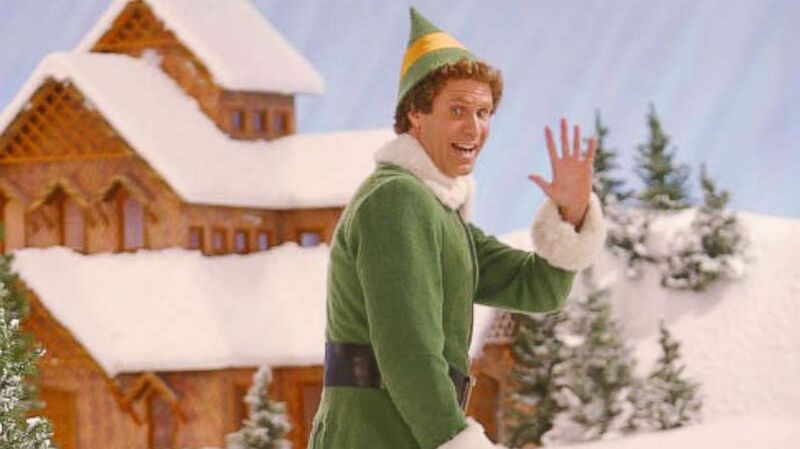 (IMDB) Will Ferrell in "Elf," 2003. “Will walks by in the outfit, the elf outfit, which he tried to stay in character. The boots that are curled up," Lange said, laughing. "I look up. He goes, 'Hi Artie.' And then he just walked past." Favreau said the team approached Macy's asking to use their store, which he thought seemed like be a natural fit for the movie, but Macy's declined. “Because we’re using a Santa, of course, everybody thinks Macy's. But Macy's didn't like the idea that there was a fake Santa working there," Favreau said. "They felt it would blow the illusion for kids." Since former brick-and-mortar New York City department store Gimbels was no longer in business at the time of filming, Favreau said his team got creative. (IMDB) James Caan and Will Ferrell in "Elf," 2003. “We approached the person that had the rights to Gimbels. And we decided to set it in a building catty-corner to the Empire State Building,” he said. Favreau chose that location so that Ferrell’s character would be kicked out of the Empire State Building and stumble directly into the store decorated like the North Pole. They added the signage and nutcrackers to that building for shooting and filmed the interior scenes of Gimbels inside a department store in Vancouver. Favreau realized Deschanel’s Doris Day-type voice would help break her cold character, who spends much of the film not feeling the Christmas spirit. 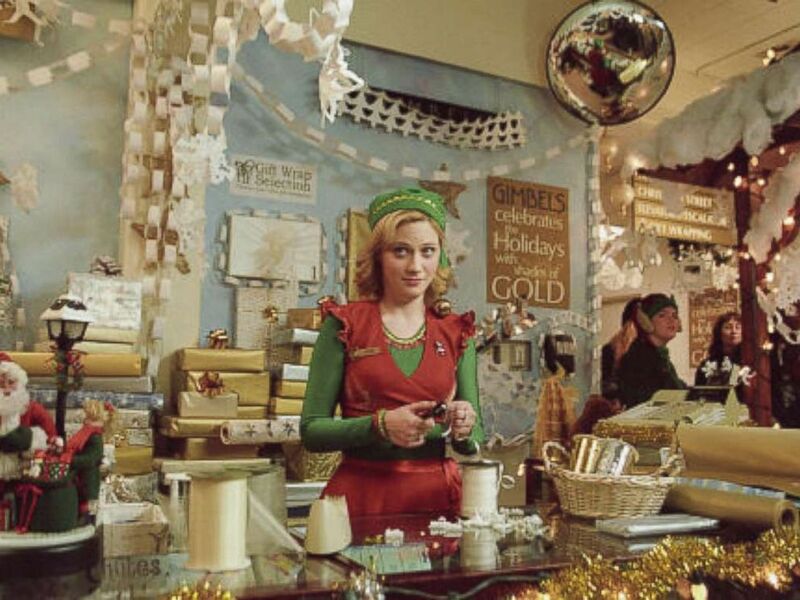 (IMDB) Zooey Deschanel in "Elf," 2003. “When I realized that she had such a wonderful singing voice, we wrote that whole sequence in,” Favreau said, adding that Ferrell was “pretty good” too. “The purity of her singing, I thought, was really nice," the director added. The wardrobe department even mimicked the famous puppet-like costumes with permission for Buddy, Santa and the other elves. 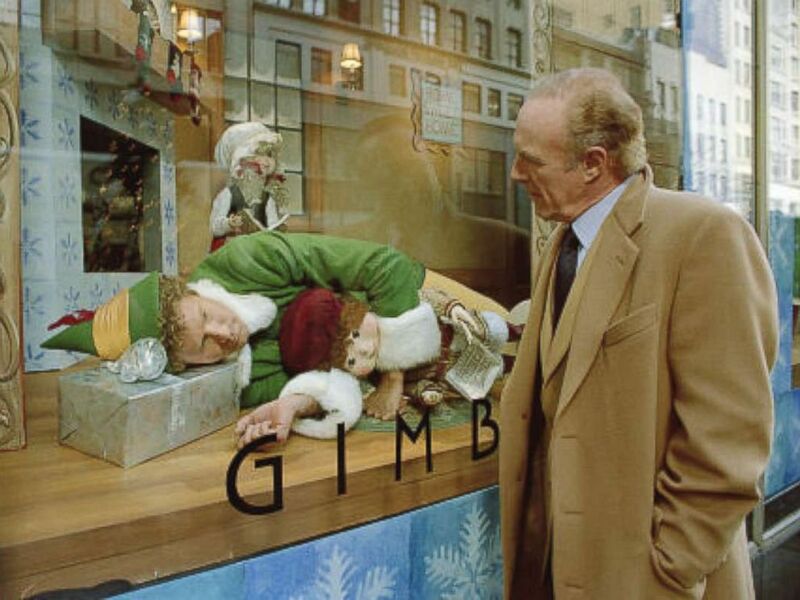 (IMDB) Will Ferrell and Bob Newhart in "Elf,"2003. 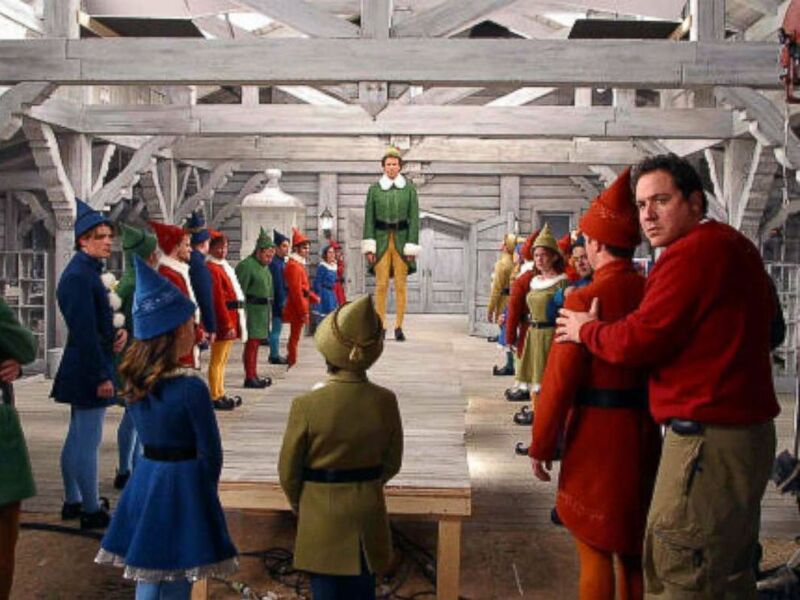 Favreau used the "forced perspective" technique while filming so that Buddy the Elf appeared larger than his surroundings and counterparts. But the director said lining up a large set and small set required extremely precise lighting to control continuity between the appearance of both the background and foreground. “If you could line up the lighting and you could line up the sets with a smaller set closer to you and a larger set further back that perfectly blend, the person in the closer set will appear to be larger than the person in the set further back,” Favreau explained. 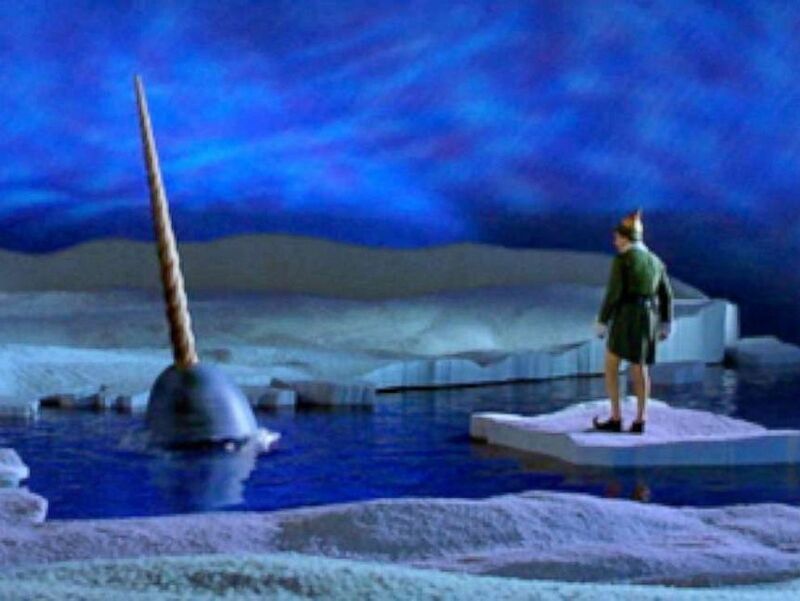 (IMDB) Will Ferrell, Jon Favreau, and Joe MacLeod in "Elf," 2003. The crew carefully made sure the two always matched. For more, watch the special "20/20 Presents: Lights, Camera, Christmas: Inside Holiday Movie Classics," on Wednesday, Nov. 22 at 10 p.m. ET on ABC.